Harvesting veggies from the garden is so much more fun than planting, weeding, watering and waiting for them to grow. There are rewards at each stage, but harvesting is the ultimate reward. Without looking into the folklore, I now KNOW from where the idea of having a green thumb comes. It comes from harvesting veggies. 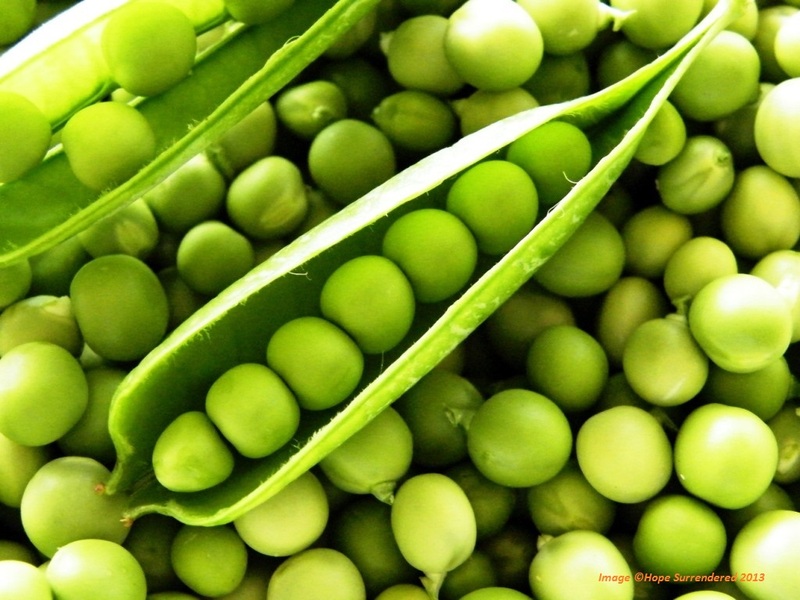 When I harvested my peas, my left thumbnail turned green from popping open the pods and scraping them into a bowl. When I harvested my Chinese pea pods, my left thumbnail turned green from snapping off the top and destringing them. When I harvested my green beans, my left thumbnail turned green from pinching them off the vine and then using my nail to break away the top. When harvesting my cucumbers, my left thumbnail turns green from piercing the vine before pulling the cuke from it. When harvesting my cherry tomatoes, my left thumbnail turns green from snipping the fruits from the vine WITH my nail. When harvesting my apples, my left thumbnail turns green from pushing the waste through the apple corer. Harvesting has been going on for a few weeks, therefore, I’ve had a green thumbnail for a while. The only thing that might completely remove the green hue from my thumbnail would be a manicure. However, other than an occasional buff and file, I’m not really a manicure kind-of-gal, and I still have some harvesting left to do. I’m pretty sure that the folklore surrounding having a green thumb DOES involve the ability to grow plants well. So, hey! I will consider my green thumb an accomplishment and as a sign of the successful harvest! The peas are finished. An abundant bounty was provided and reaped. I spent a lot of time preparing the soil, selecting my seeds, planting with care, pruning seedlings, pulling weeds and praying over what I hoped would grow. My wish was to provide healthy, organic veggies to my family and feed my interest in gardening. At the first picking, I was like a child who had gotten into a jumbo bag of chocolate candies. Really! That’s how excited I was to get out there and pluck the pods from the vines! I was so pleased with how the peas had grown. As I was picking, I’d pop open some of the pods and taste the freshness contained within. Some of the peas were nestled in their pod in a perfect row; others were odd-shaped or off-kilter when cracked open. Some should have stayed on the vine a little longer (my yearning to pluck them got the best of me), but their sweetness was still divine. There were a few more pickings that followed, but the bounty was less each time. My excitement seemed to lessen with each subsequent picking. The time came to decide if I thought I’d get any more peas. There were a few flowers and even fewer flower buds, so I left the vines in place with the hopes of getting one more small crop. I did, but it was only enough for one family dinner. Once I knew the supply was exhausted for the season, it was time to pull the vines. 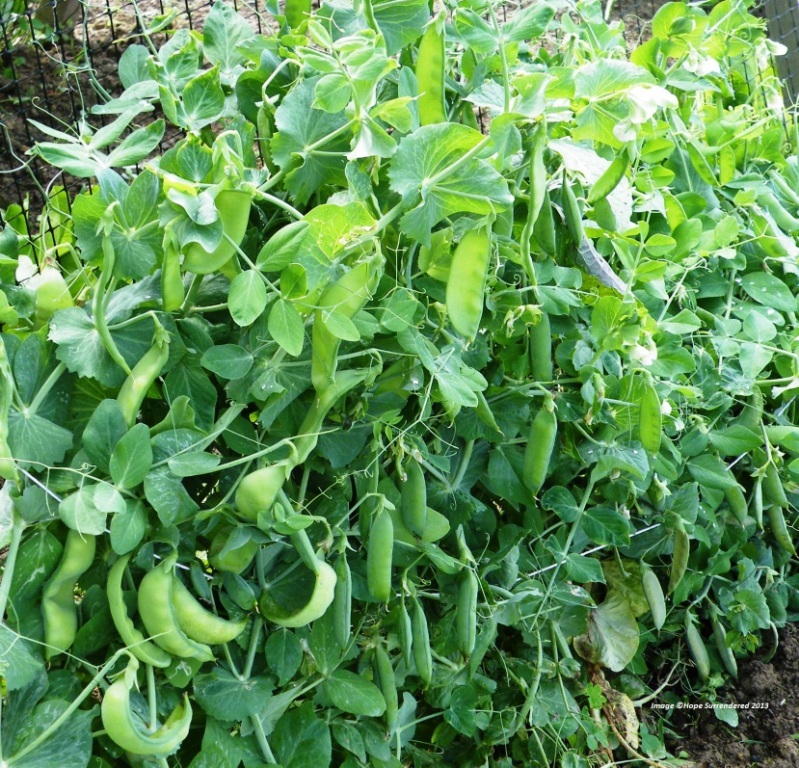 Have you ever grown peas before? There are an abundance of vines. Each dried pea planted is a vine grown. The vines are leafy and full. Pulling the vines led to the discovery of a tiny weed and bug menagerie living at the soil level. With each handful of vines I pulled, I’d say a little prayer of thanksgiving for the abundance provided. (When I’m in the garden, I talk to myself, and I talk to the Lord a lot.) Cleaning out the vines, weeding the new space, turning over the soil and preparing it for the next planting was not as fun and exciting as it was when I did it for the first planting, but it was rewarding since I knew the bounty would grow with some care and nurturing. Gardening doesn’t always turn out successfully with a single crop or even within a single season, but, overall, an educated gardener should be able to expect a satisfying crop over the span of seasons. Life doesn’t always turn out exactly how we’d like it to in a day, a month or a year, but an invested believer can trust in that which is promised. Welcome to a new week! Thanks for venturing into it with me! Last weekend, I wrote about paddleboarding — you can read that here: http://wp.me/p1oeLN-2I. I know the subject didn’t quite fit into the rest of the writings I’ve shared, but I was (and still am) looking for a way to throw in some tidbits outside of faith-based hope writings of the week. So…welcome to a new week! Monday’s Musings? Wonderings from the Weekend? I need a title. Any suggestions? My plan — my hope — is to start the week by offering up a lighter post that goes along with something I experienced, did, thought about, etc., at some point during the previous week or weekend. I don’t know it it’ll work out, but I’m going to try to get my hands dirty at trying it. The rains have been abundant in this part of the country, which has led to my garden being just a tad neglected. I’ve been behind in my weeding. With a break in the weather this past week, I decided to head out to the garden and take on the task of weeding. I wear gardening gloves for planting and digging, but I feel like they hinder my ability to pull weeds, so I often don’t use them for this task. This presents a dilemma when it’s time to clean up. So this week, I tried a little experiment. I got an old bar of soap, and I scratched my fingernails into it before venturing out to the garden. This bar of soap will stay with my gardening tools, as it’s not very pretty anymore. For the most part, it worked. 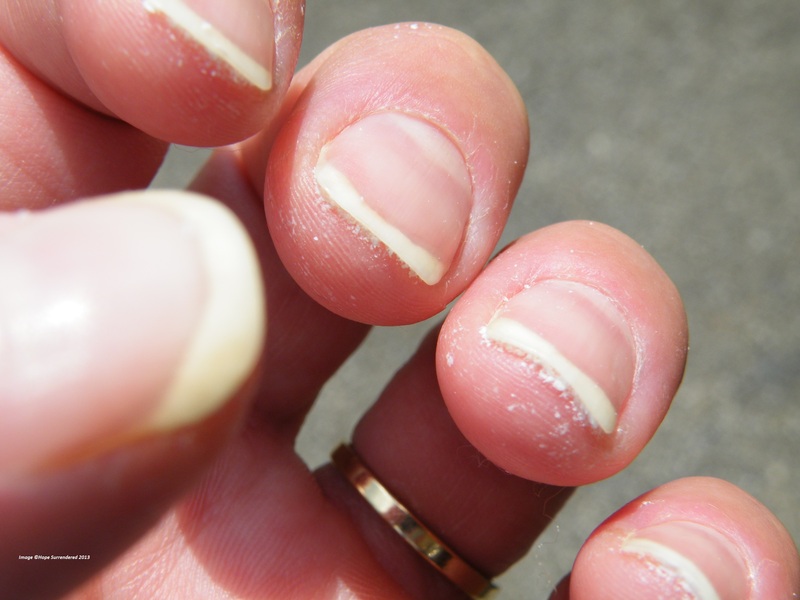 When I was finished, I used a nailbrush on my dirty fingernails, and the soap that had been under my nails made clean up easier. The neglected garden gave me a lot more to think about. Friday’s post was a start — you can read that one here: http://wp.me/p1oeLN-3W — and you’ll probably see some more of those thoughts in the coming days. Make it a point to find hope around you this week. It IS there! Enjoy your week!